Episodes in the history of data, from early modern math problems to today's inescapable âdataveillance,â that demonstrate the dependence of data on culture. We live in the era of Big Data, with storage and transmission capacity measured not just in terabytes but in petabytes (where peta- denotes a quadrillion, or a thousand trillion). Data collection is constant and even insidious, with every click and every âlikeâ stored somewhere for something. 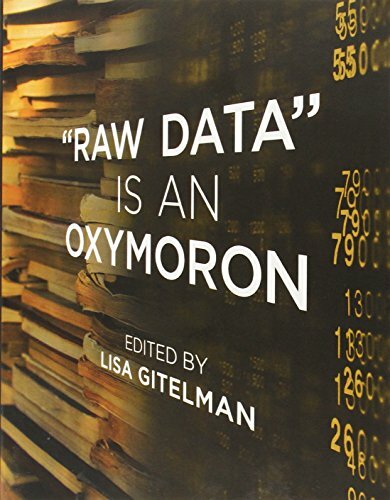 This book reminds us that data is anything but âraw,â that we shouldn't think of data as a natural resource but as a cultural one that needs to be generated, protected, and interpreted. The book's essays describe eight episodes in the history of data from the predigital to the digital. Together they address such issues as the ways that different kinds of data and different domains of inquiry are mutually defining; how data are variously âcookedâ in the processes of their collection and use; and conflicts over what canâor can'tâbe âreducedâ to data. Contributors discuss the intellectual history of data as a concept; describe early financial modeling and some unusual sources for astronomical data; discover the prehistory of the database in newspaper clippings and index cards; and consider contemporary âdataveillanceâ of our online habits as well as the complexity of scientific data curation. About: Episodes in the history of data, from early modern math problems to today's inescapable “dataveillance,” that demonstrate the dependence of data on culture.